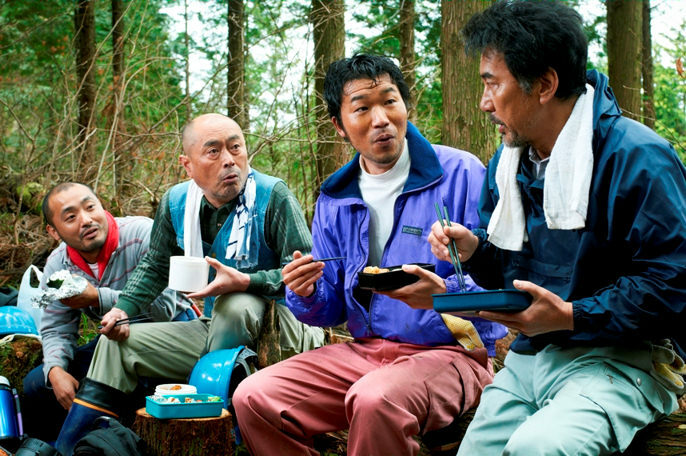 The Woodsman & the Rain (Kitsutsuki to Ame / キツツキと雨), directed and written by Shuichi Okita (screenplay by Fumio Moriya) is a heart-warming and funny tale of an unlikely friendship. When we first see 60 -year old Katsu (played by Koji Yakusho) he is hard at work felling trees in the small, peaceful mountain village where he lives (in Gifu, I think). Suddenly interrupted by the arrival of a film crew who ask him if he wouldn’t mind keeping the noise down while they film, he is put out at first, but somehow finds himself roped into helping them. The crew are pushy, asking for favour after favour, and Katsu ends up helping them despite finding the seemingly useless director, Koichi (played by Shun Oguri), incredibly frustrating. The movie turns out to be a zombie movie, and before he knows what’s going on Katsu has agreed to help further by being an extra in the movie. Somehow, this leads to a strange but touching friendship between himself and the 25-year old director, and Katsu starts to enjoy himself, even taking a sickie from work so he can help with the film. 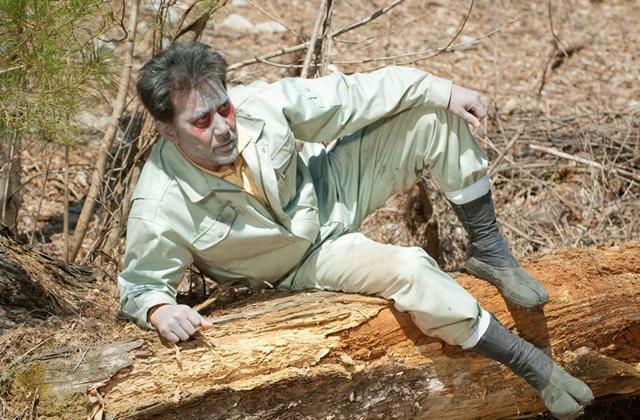 Once he is fully committed to the movie, he does everything he can to help, including asking other villagers to take part as zombies and the humans fighting against them. As with all the Japanese movies I find myself enjoying, this is a bit of a quirky film. The film within the film – the zombie movie – is truly awful, but it’s not a story about the making of an amazing film director, it’s a story about the making of men. Both Katsu and Koichi need someone or something in order to progress with their lives, and they find that in each other. 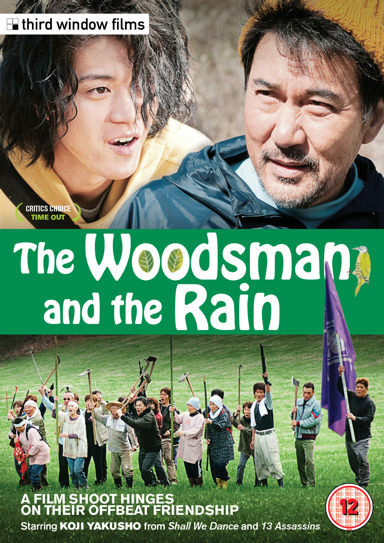 The Woodsman & the Rain is available in the UK on DVD and BLU-RAY from the Third Windows Amazon shop. All of the images in this post are courtesy of Third Window Films, © 2013 Imgur, LLC. I really liked this film. Its relaxing and well made and quite meaningful and the two lead actors are brilliant (Koji Yakusho is brilliant in everything I have seen him in). I think I can watch it multiple times. I’m glad you liked it too! I thought it was a lovely film, and not at all what I was expecting. Sounds fun and quirky – I’ll give it a try.